Experience a fusion of fine food and casual dining in laid-back luxury in the hotel's newly refurbished, Grill style restaurant. 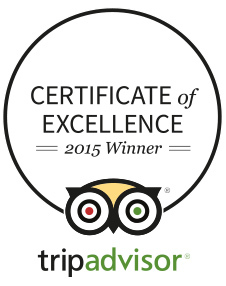 Delve into the hidden beauty of Cornwall with help from the hotel's expert local knowledge! 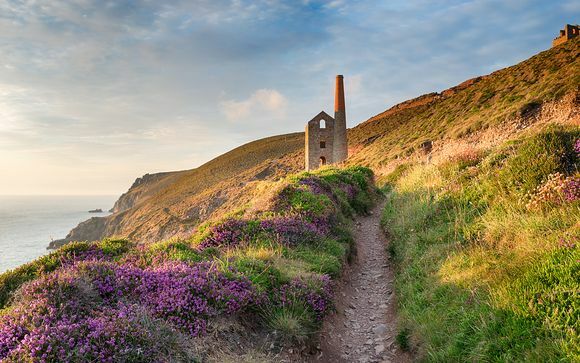 Enjoy a peaceful retreat while you explore England with some of Cornwall’s best beaches and rugged coastline along with refreshing walks, mines and monuments all nearby. Whatever the season, there is so much to see and do in this stunning county! On land there are fabulous markets to seek out unique treasures and local delicacies; inspiring and intriguing walks with monuments, mines and castles; sub-tropical gardens with rare beauties; and horse-riding Poldark style if it takes your fancy! By the coast stumble upon secret beaches and picturesque fishing villages; watch the boats bob or the waves crash; tuck into the freshest local seafood or watch a game of Polo on the beach with glass of Champagne in hand. Here’s our round-up of just some of our favourite things to do in Cornwall including hidden gems, days out and attractions. 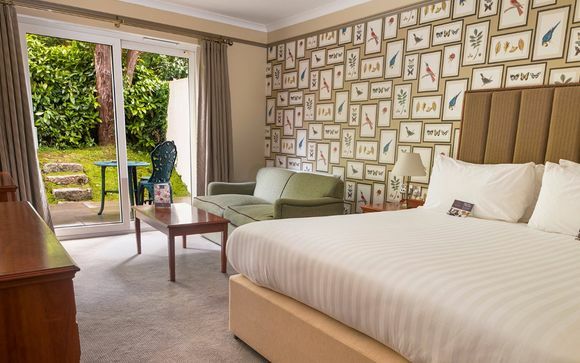 The Penventon Park Hotel is a hidden gem in the heart of Cornwall’s mining capital of Redruth. Tucked away down a tranquil avenue of verdant trees and subtropical palms you’ll be surprised by the grand reveal. An impressive façade of the former Georgian Mansion house standing proud and ready to welcome you to one of the finest, boutique hotels in Cornwall. Independently owned and run by the Pascoe family for over 45 years, Penventon is a charming, and elaborate hotel, restaurant, spa and special occasions venue. Beautiful and spacious these suites are the hotel's most recent and luxurious addition. They feature vibrant decor in hues of blue and gold, Venetian marble-clad bathrooms with a blue glass feature wall & Noble Isle toiletries and lounge area. If you are staying on the ground floor your suite leads out onto your own private patio. Just for you: £27 allowance for your evening 3-course meal served in main restaurant - excludes drinks. Available each night of stay. Classic decor styles juxtapose with modern surprises to create an opulent setting filled with alluring aromas. A feast for the both eyes and your taste buds; curious art collections adorn the walls and classic dishes such as Chicken Duchesse with truffle creamed potatoes staying true to traditional Georgian roots. Whilst leather and brass button back chairs, Steampunk lamps and gourmet junk dishes including Pulled Pork topped Mac ‘n’ Cheese with Jalapeño Salsa offer a modern contrast. If you’re a meat lover, experience the ultimate in charcoal fuelled-flavour in our Grill section. Devour dishes with a delicious, caramelised, BBQ taste all year round from our signature “Wood Charcoal Oven” boasting cooking temperatures of 500 degrees +. 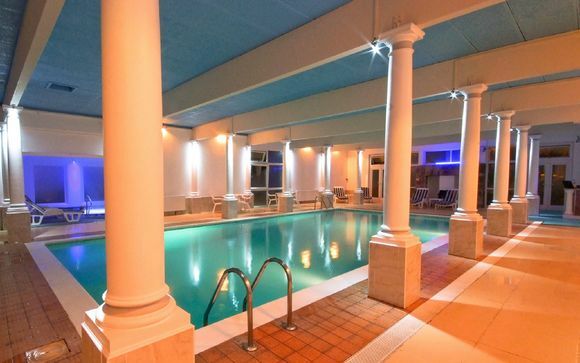 Open to members, hotel residents and day visitors, burn off some steam in our fully equipped fitness suite, take a dip in the 12 meter long heated indoor swimming pool, wind down in the sauna and Jacuzzi or treat yourself to a luxurious spa or beauty treatment. One of the only Leisure Spas in Cornwall offering poolside dining the hotel's attentive team are on hand to serve you. Whether you fancy sipping on a cool cocktail or glass of bubbly, a bite to eat, afternoon tea by the pool or just a fresh towel, just ask and they’ll bring it to you. Transport is not included in this offer. Your hotel is approximately 5min / 0.7miles from Redruth Train Station by car.